I arrived in Athens on the 6th of September after an 11 hour flight, got my passport stamped, got rid of my American dollars and my adventure began. I opted for the metro to get to the Dioskouros Hostel, wanting to be engulfed by the city and the people. I got off at the right stop and eventually found the hostel after wondering the wrong way for a while. I was ready to get away from my bags but eager to get back out to explore Athens. I recognized some girls I thought were a part of Athena Abroad introduced myself and had lunch with them. That night we went out to a fancy restaurant for appetizers and wine before we went out for dinner. The charming Greek waiter gave us each a glass of free wine. The most gratifying part was seeing people’s faces as they ate food they had never had. Many felt as if they had never really tasted before. The restaurant brought all of their small dishes for you to choose and share at the table, foreign to some, but felt like home to me. 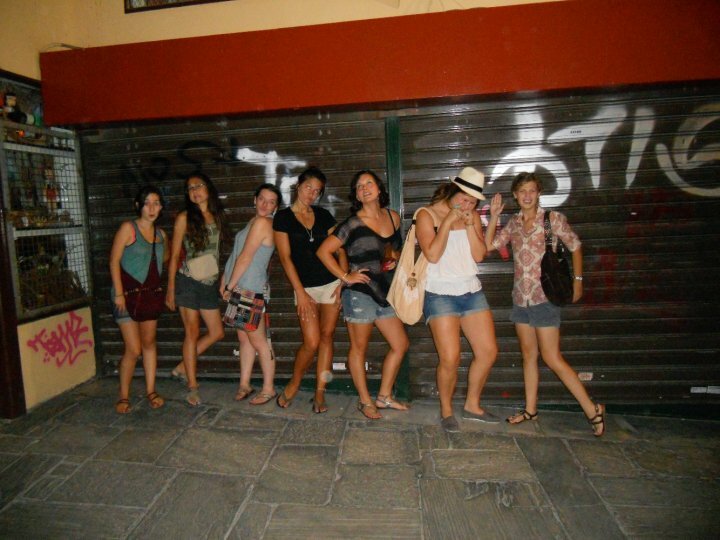 Only having a few days in Athens, I made the most of every minute I had. My first day started at the Acropolis. I was a little disappointed by the herds of tourists at first, but forgot all about them as I gazed in amazement at the monument I had learned about but only ever saw in pictures. The view from the lookout is a breathtaking panoramic of all of Athens. Our next stop was the few remaining pillars of the temple of Zeus. Then we managed to live crossing a few streets to get the original Olympic stadium. 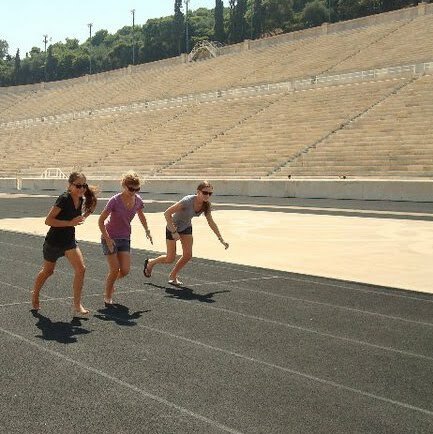 We kept our clothes on, but kicked off our shoes and ran on the track of champions. After lunch and a short rest we ventured out again. We made our way through the national gardens to the Parliament building to see the changing off the guards. Guarding the tomb of the Unknown Soldier is an honor and it showed in the guards as they stood completely still in the hot sun as crowds of tourists gawked at them and took their picture. As the new guards were marching to take their post a tourist, not realizing they were walking directly toward her, got kicked by a guard. I would probably do a lot more than that if I had to put up with what those guards do. That night we went back to the same restaurant for dinner with 16 people. Two of the professors arrived as well as more students. The professors started off dinner by buying everyone ouzo...still not for me, but maybe i'll learn. Pulled my Chaco straps tight and set out for day two of taking in as much of Athens as I could. First stop was the acropolis museum, just as breathtaking as The Acropolis itself. The top floor is set up in the same way and with the original dimensions of the Parthenon freeze on the wall, and the freeze with the metopes and triglyphs above. They even have the pediments set up with some original pieces and some reconstruction. Seeing the set up only added to my amazement of the immense scale and detailed craftsmanship of the temples and sculptures. We sat in the café and I had some Greek coffee, gritty and bitter, I think I’ll stick with espresso. A short hike from the museum is the Ancient Angora, resembling more of a rocky tree scattered field than a once bustling market, and the birthplace of Greek democracy. Similar to the other ruins I visited, there was beauty in the mystery of what could have been and the attempt to preserve what little is left. Venturing further from the Acropolis we visited the ancient cemetery. The cemetery, however, was quite alive…with turtles. After fulfilling the art historical dork in me, I got to see more of contemporary Athens culture. I watched a street performer blow enormous bubbles for gleeful children, scavenged for treasures at the flea market, and walked through winding back streets as the sun started to set on my last day in Athens. That night over 20 people from the abroad program had dinner together. Then a few of us ventured back into the winding back streets to a little restaurant where there was live music and people dancing. 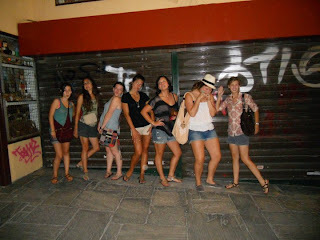 We met a crazy Italian that tried to make us all dance and drink ouzo and invited us to come stay with her in Milan. Then there was someone not much older than me dancing with someone who was old enough to be her grandfather, it was no longer an innocent dance when she made out with him…he looked pleased with himself and just went back to working the restaurant. Once the music was done we found a bar down the street with a sprawling outdoor space in the back. I met a man who does photography, and used to teach French in California. I think it is unavoidable to fall for Greek men. 4am, back at the hostel with enough time for a one-hour power nap before getting up to catch the ferry to Paros.